Erkunden Sie Guatemala City und machen Sie eine Reise zum Gipfel des Vulkans Pacaya in Antigua auf diesem geführten, 7-stündigen Spaziergang. Dieser aktive, komplexe Vulkan brach zum ersten Mal vor 23.000 Jahren aus. In den letzten Jahren gab es häufige, moderate Ausbrüche, Lavastrom-Austritte und sporadische Phasen mit Lavafontänen. Wählen Sie zwischen einer Abfahrtszeit am frühen Morgen oder Nachmittag. Wandern Sie nach einer 1-stündigen Fahrt mit dem Bus zum Fuß des Vulkans zum Gipfel und bringen Sie eine Kamera mit, um den Moment festzuhalten. Abholung vom Hotel und Transfer zum Hotel im Preis inbegriffen. The principal destination was the The Lava Shop. was made clear in the posted trip details. Definitely recommend the volcano trek! Great experience! The guide was not really bilingual mainly Spanish-speaking... and I was charged 9 for the entrance ticket although the site and reservation voucher specifically said 7. However the driver was a disaster, he was going too fast, as if he was in a rush of going back to Antigua, he almost crashed with a truck, was using his cellphone while driving, etc. I'm rather used to imprudent driving, since I'm from Colombia, but this guy was crazy and dangerous. I wouldn't recommend the tour unless they change the driver. I'm surprised there isn't a lot of reviews for this tour because it was a great time! We booked the 6AM trip through tripadvisor and the booking process was easy, we had to confirm our reservation and timeslot through a travel agent via email The checkout process doesn't allow you to specify the time of day. The shuttle picked us up at our address a little late but only because it has to shuttle around the city to pickup all of the hikers. Be sure to have the driver's number on hand for the pickup so that you can call and get an estimated arrival time. The shuttle stopped for coffee before leaving Antigua. The hike is steep but the trail is well established with a clearly defined trail. Be prepared to pant and sweat a little : If the hike is too much you can rent a horse before or while on the trail. There are also locals selling walking sticks if needed. Bring plenty of quetzales, the booking does not include entrance fee I think it was 50Q, horse, sticks, food, or tip for the guide and driver. Be sure to bring plenty of your own water, lunch, and snacks. There are only a few stands selling packaged food at the entrance of the trail. Note that this volcano was not currently active when I visited in 2017. I believe the last erruption was in 2014? We could hear rumbling noises from the volcano and see steam/ash but no active lava flow. The guide brings marshmallows that we roast in holes surrounded by warm rock. The views at the top of the mountain were breathtaking and rewarding. We spent a good 1hr at the top taking in the views and marshmallows. Definately a great escape for those looking to get out of the city for a while and are interested in hiking and nature sighseeing. Great experience at the mountain. I enjoyed the views and the short, but at times steep, hill up. 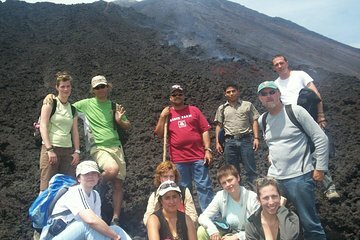 The trip from Antigua to Pacaya was long and uncomfortable. It was a 2.5 hour ride and the car was extremely cramped - it was filled to capacity and not enough room for your legs, let alone your bags. expecting to see more active lava, we also stayed quite low from volcano top.